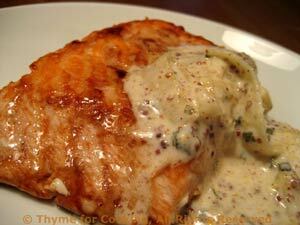 Salmon with Mustard Cream, Thyme for Cooking easy gourmet dinner. When baking salmon, I line the baking sheet with foil and cook them, skin side down, without turning. When they're done, I slide them off the skin and on to the plates, leaving the skin behind on the foil to wrap up and toss. This is a cross between a salad and a vegetable. I've added a bit of bacon to it but you can leave it out for a vegetarian version. 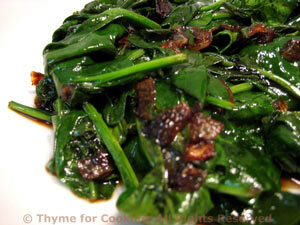 Be careful to cook the spinach for a just a minute, only to wilt slightly. Wash and stem spinach if needed. Drain in a colander. If you don't feel you need to wash it - do it anyway. We want a little bit of water on the leaves - what ever is left on the leaves after draining well. Cut any really large leaves. Heat oil over medium high heat in large nonstick skillet. Add vinegar, thyme, sugar and heat through. 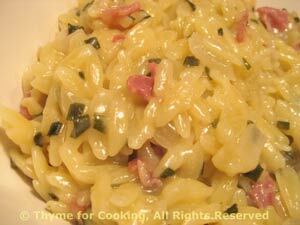 Add spinach and quickly stir-fry, 1 minute. The spinach should just start to wilt. Remove, sprinkle with salt, pepper and serve.